Candy is not a food. At least, I do not think it is a food. Well, let me back up and say that I used to think of it as a food. You do not have to have candy. In fact, some people do not eat candy. I am still tracking my calories at MyFittnessPal.com and it is fantabulous! Somehow, seeing the empty nutritional value of candy laid out before my very eyes has started to change the way I look at it. 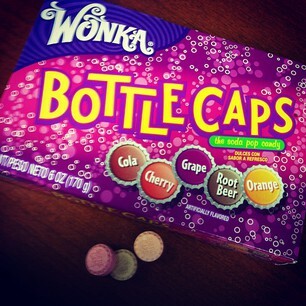 Take Wonka's Bottle Caps Soda Pop candy for instance. A "serving" is 13 little tiny pieces. In just those 13 pieces, there are 60 calories. Calories and sugar. No protein, no nothing. Just calories and sugar. Consider that, and the fact that very few of us actually only eat 13 pieces in a sitting. It. adds. up. It eats (pun, ha!) away at your caloric recommendation for the day. It adds nothing to your diet. Yet, we still want it. Can we have a little? YES, we can. ...but back to what I said earlier, it is a T-R-E-A-T.
Not a meal, not even a snack. Just a small treat. Today I wanted a few of said Bottle Caps. I opened the box, took out 3 little pieces, and put the box away. I savored the 3 pieces, individually. I ate them slowly, enjoying their sweet, bubbly taste. I entered my 3 Bottle Caps into myfitnesspal. 14 calories. I can totally handle 14 calories. It is the 180 or 240, or even 300 calories worth that could have sabotaged my entire day. I am happy. I had a treat, not a binge. 14 calories for the Win!